The Baby Boomer generation is the largest demographic in the U.S. population, and as the tail end of the segment becomes eligible for their AARP card, they are also becoming the fastest growing segment of the fitness population. Over the last decade, the number of health club members over the age of 50 has grown exponentially, virtually exploding in comparison with the rest of the membership. One reason for this rush to the gym is quality of life. As Baby Boomers age, they are determined to enjoy a more active lifestyle than their parents before them, and are determined not to let aging get in their way. Many of the conditions once thought to be strictly a product of the aging process are actually more closely related to inactivity, including obesity, diabetes, high blood pressure, heart disease and osteoporosis. Being active and physically fit as we age helps stave off these health issues. Exercise has even been shown to slow cognitive decline. Fitness centers themselves have made it easier for the Baby Boomers to find a time and place to exercise, as many large chains have cropped up around the country offering stressed mid-lifers nearby places to pop into for a quick workout. These types of fitness centers have taken the idea of a health club or gym from being an elite, specialized facility and put it more on the par with a laundromat or beauty parlor; some place where you can get what you need and get on with your busy day. 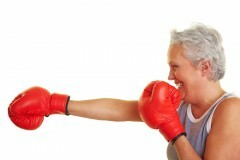 Older clientele present a unique set of challenges for fitness facilities and their staff. They are more likely to be sedentary, not used to working out and unfamiliar with the latest equipment. They will need a great deal of attention, instruction and supervision. Your more senior customers are likely to be fragile; with brittle bones and easily strained musculature. They need to progress more slowly than younger clientele. They will benefit greatly from simple, weight bearing exercise such as walking on a treadmill; however they will also need to carefully trained and monitored when using this equipment. Gym owners who wish to take advantage of this rapidly growing segment of the population may wish to hire trainers experienced in working with elderly clients, and tailor specific classes for their fitness levels. Massage therapy greatly helps improve flexibility and range of motion, and is likely to be a big hit with the Boomer crowd. If your business is a little off in these tough economic times, consider tailoring a special advertising program to bring in this huge population of new clientele! Also, a search throughout the website will uncover many great ideas and research on the subject.